The indigenous Taino people inhabited the island of Hispaniola until 1492 when Columbus explored the island and claimed it for Spain. The Dominican Republic was then home base for Spain’s activities in the region. In 1697 France was formally recognised as having dominion over the western end of the island, which later became Haiti. In the early 1800s the Eastern two thirds of the island was known as Santo Domingo, and it was conquered by the Haitians who ruled for 22 years. In 1844 it gained independence as the Dominican Republic. A period of instability followed which included the dictatorship of Rafael Leonidas Trujillo from 1930-1961. Currently an active democracy, the Dominican Republic is a popular holiday destination. Strong ties to Spanish culture remain, including those to the Spanish language. The island is also influenced by its Taino and African roots, which is apparent in architecture and music. There are many beautiful vacation destinations within the Dominican Republic, and the island is most famous for large all-inclusive resorts catering to Europeans and North Americans. To find Dominican Republic villa rentals by owner, for your next holiday, simply select Dominican Republic as the destination in the “BROWSE BY” tool bar towards the top of the page. If you have set vacation dates use the “AVAILABILITY SEARCH” box, which blends in/out to the right of the slideshow. Alternatively, you can simply browse through the following list of Dominican Republic villa rentals by owner. El Ingenio 9 is a luxury, fully staffed, five bedroom villa with a large heated swimming pool and beautiful tropical gardens. This luxury Dominican Republic villa rental is located within the famous Casa de Campo Resort near La Romana, which has four world-class golf courses. El Ingenio 9 offers 600 square meters (almost 6,500 square feet) of luxurious living space and the housekeeper and cook will ensure that your Dominican Republic vacation is perfect. Find out more about El Ingenio 9, Casa de Campo, La Romana, Dominican Republic. Casa Corazon is located in a 25 acre, private, gated community near Cabarete in the Dominican Republic. This beautiful, 5 bedroom, 5 bathroom Dominican Republic villa rental is the perfect place for your vacation. Casa Corazon sleeps up to 12 people and can be rented as a 4 bedroom or 5 bedroom Dominican Republic holiday villa. This luxury villa perfectly combines simplicity and elegance. With three level, infinity-edge swimming pool, jet tub, spacious decks, beautiful tropical gardens and stunning ocean views, your stay at Casa Corazon will be truly memorable. Find out more about Casa Corazon, Cabarete, Dominican Republic. The most romantic Caribbean villa. Situated in the prestigious ocean front section of Sea Horse Ranch, near the Puerto Plata airport in the Dominican Republic. This magnificent villa presides on nearly a half acre of ocean front grounds with gorgeous sea views. Designed by acclaimed Dominican architect Sergio Escarfullery, it exemplifies gracious Mediterranean style and an atmosphere of old world elegance and charm. Ataraxia means a state of freedom from emotional disturbance and anxiety; tranquillity. You will definitely experience ATARAXIA here! Find out more about Villa Ataraxia, Sea Horse Ranch, Cabarete, Dominican Republic. The most magnificent six bedroom (4 kings, 4 fulls), villa on the beach front at Sea Horse Ranch was built with Fine Caribbean Living in mind. The U shape wrap around design provides privacy for the guests that stay in each of the well appointed six suites. Reminiscent of Caribbean plantation homes with louvered windows and doors, vaulted ceilings and rustic beams, this Dominican Republic villa will transport your body and soul to the tropical splendor of days gone by. The exuberant colors and thatch roof exemplify the fun carefree Caribbean living you will enjoy during your stay. Find out more about Casa La Bandera, Sea Horse Ranch, Cabarete, Dominican Republic. Villa Windsong in the Dominican Republic captures the essence of relaxation, making the quintessential beach home a reality. Lush tropical gardens filled with native fruits and countless palm trees provide an exclusive and private settings. Asian influences are seen in the raised wooden entrance and the outdoor walkways, as well as the beachfront gazebo facing the sunrise for yoga, reading or meditation. Native coralina floors containing dramatic shell shaped fossils paired with local river stone inlays inspire you to relax and live in harmony with the sound of the ocean. Find out more about Villa Windsong, Sea Horse Ranch, Cabarete, Dominican Republic. Built in 2005, this five bedroom, 5 bath villa boasts a perfect location just adjacent to the Beach Club area and beaches of Sea Horse Ranch in the Dominican Republic. Tuscan inspired architecture blends perfectly with Caribbean elegance with cream marble floors and baths and a large ample terrace for al fresco dining and entertaining. Find out more about Villa Mediterranea, Sea Horse Ranch, Cabarete, Dominican Republic. A Dream Villa with exquisite space and location on Sea Horse Ranch, Dominican Republic. 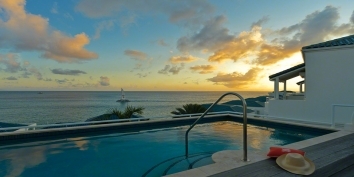 This 4 bedroom luxury Caribbean property is priced on outstanding quality and location, not a spirling speculative market. A classic beach villa with symetrical architecture, soaring ceilings and Mediterranean roof lines. Find out more about Villa Diana, Sea Horse Ranch, Cabarete, Dominican Republic. This newly finished Dominican Republic villa rental offers a vibrant modern internal design, while the outward appearance fits comfortably with the traditional aspects of the surrounding estate properties. The villa is two story block and concrete construction externally, with additional natural timber post and roof entrance porch. Internally the extensive use of select seasoned hardwoods and American pines add to the open natural ambience. Find out more about Villa Jasmine, Sea Horse Ranch, Cabarete, Dominican Republic. This gorgeous Mediterranean villa with modern appeal is brand new and one of the best rentals in the Caribbean! Casa Brillante has 4 bedrooms, 5 bathrooms and is located in the prestigious Sea Horse Ranch community in the Dominican Republic. Find out more about Casa Brillante, Sea Horse Ranch, Cabarete, Dominican Republic. This elegant four bedroom, five bathroom Dominican Republic villa rental resplendently blends casual Caribbean architecture and Mediterranean inspired design with dramatic roof lines and graceful silhouettes. The stately foyer opens to the ample living room and refreshing aqua views of the lap size swimming pool and reflection pond. Find out more about Villa Bali, Sea Horse Ranch, Cabarete, Dominican Republic. Tropical minimalism and refined use of materials define this 4 bedroom modern Dominican Republic villa rental. Set against the fluidity of a magnificent reflective pool and Japanese inspired outdoor living space. The simple and elegant use of marble, cedar and stone communicates harmoniously with the pool’s water reflection and surrounding exterior vegetation. Skylights push your eyes up to sky blue visuals while retractable glass doors erase architecture, replacing it with absolute connection to the natural Caribbean setting. Find out more about Villa Nirvana, Sea Horse Ranch, Cabarete, Dominican Republic. Casa Colonial is a luxury 4 bedroom Dominican Republic villa rental with creamy marble floors, vaulted natural wood ceilings and gorgeous wrought iron work. Casa Colonial has two guest wings and extensive indoor and outdoor living areas. It boasts the largest pool of any rental villa at Sea Horse Ranch. The beautiful interior with its garden vistas creates a serene and rejuvenating living experience scarcely found elsewhere in the world. Find out more about Casa Colonial, Sea Horse Ranch, Cabarete, Dominican Republic. Villa Allegra is a four bedroom one-story home on with an ocean view from the terrace and pool area. This Dominican Republic villa rental was renovated and opened up to let the outside in! Two master bedrooms make this a comfortable rental or vacation home. One master bath renovated in 2006 features a walk in shower and an impressive Jacuzzi tub, the other has his and hers walk in showers. Find out more about Villa Allegra, Sea Horse Ranch, Cabarete, Dominican Republic. This 4 bedroom Dominican Republic villa rental is beautifully finished with walnut hardwood doors, louver windows and Mexican tiles. Villa Las Palmas has a free form swimming pool with waterfall and is surrounded by beautiful tropical gardens and towering palm trees. Part of the prestigious Sea Horse Ranch community in Cabarete it is only a short distance to Puerto Plata airport. Find out more about Villa Las Palmas, Sea Horse Ranch, Cabarete, Dominican Republic. Villa Flora, a Superior Tropical Garden villa, is one of our most frequently requested Dominican Republic villa rentals! Enjoy the cool feeling of marble floors on your bare feet throughout this spacious, open and inviting home. The exquisitely verdant rear gardens are sheltered by an elegant stone wall replete with lush tropical plantings, providing the ultimate in villa privacy for entertaining and late night swims in the illuminated turquoise pool. The refreshing large classic designed pool is enhanced with a lovely waterfall, an added therapeutic sound for poolside lounging and al fresco dining. Find out more about Villa Flora, Sea Horse Ranch, Cabarete, Dominican Republic. Villa Jardin Paraiso is a Caribbean vacation villa that beautifully blends tropical living with clean modern architectural lines. The large main room and terrace is where guests enjoy breezy cross ventilation and casual dinners from the gourmet kitchen. Villa Buena Vista is located in the prestigious Sea Horse Ranch community in Cabarete, Dominican Republic. Find out more about Villa Jardin Paraiso, Sea Horse Ranch, Cabarete, Dominican Republic. Villa Zen is a surfer ultra chic chill out in Cabarete, Dominican Republic! This Caribbean vacation rental villa was completely remodeled in 2011 and has 4 bedrooms and a very imaginative swimming pool. Located at the prestigious Sea Horse Ranch community only a short distance from Puerto Plata airport. Ask for long term rental. Find out more about Villa Zen, Sea Horse Ranch, Cabarete, Dominican Republic. 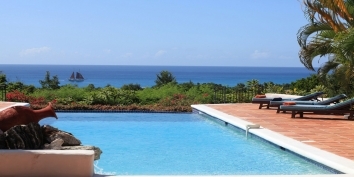 Villa Pacifica is a two-story Dominican Republic villa rental with four bedrooms. Enjoy the light and breezy living room that opens to the sprawling lawned garden and large swimming pool. Villa Pacifica is part of the prestigious Sea Horse Ranch community in Cabarete with Puerto Plata International Airport only a short distance away. Find out more about Villa Pacifica, Sea Horse Ranch, Cabarete, Dominican Republic. Villa Marabou is a comfortable, two story, Dominican Republic villa rental with three bedrooms and private swimming pool. Located at the prestigious Sea Horse Ranch residential community in Cabarete with easy access to Puerto Plata airport. Villa Ventana is the perfect location for your Caribbean vacation. Find out more about Villa Marabou, Sea Horse Ranch, Cabarete, Dominican Republic. Villa Tropicalia is a recently remodeled Mediterranean style 4 bedroom villa with 4 bathrooms and exceeds all the standards of high quality: hard wood windows and doors, fine European cabinetry, granite counter tops, European porcelanato floors, American and European standard fixtures, plumbing and wiring. Located in the Sea Horse Ranch residential community in Cabarete, Dominican Republic. Find out more about Villa Tropicalia, Sea Horse Ranch, Cabarete, Dominican Republic. Is your Dominican Republic villa already unique on CARIBIQUE? If not, find out how to list your Caribbean villa now!